The Hippocampus School aims to bring you all the world of horses. 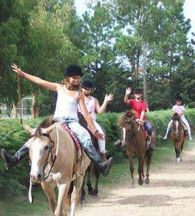 Leisure riding is ideal for those who want to learn to ride a horse well and overcome any prejudice or insecurity to do it, but they are not interested in the sports side. The school has a staff of bilingual instructors selected, fully trained for students of all levels and for all our activities.